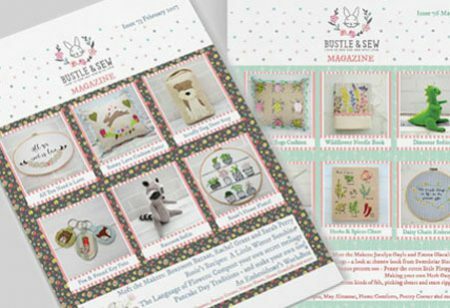 The Bustle & Sew Magazine isn’t your average news stand offering, it’s more of a mini-book full of goodies designed to appeal to everyone who loves to create lovely items for home and family. We don’t just limit ourselves to sewing though this is of course is very much at the heart of every issue. We love to celebrate the simple (and totally wonderful) things about life here in the English countryside well enjoying creating with needle and thread, indeed sewing is very much at the heart of every issue. So inside you’ll discover a collection of six new Bustle & Sew projects as well as features, articles, a round of online goodies, baking – and even a poetry corner. This month, we’re catering for boys and girls with our dinosaur and unicorn softies, enjoying the first seasonal produce from our gardens and stitching a pretty herb chart for our kitchen wall. We have interviews with two very talented makers and a special Hopeful Hatchling bonus pattern too! Don’t forget, you are free to sell items you personally have made from Bustle & Sew patterns. All the templates are full size, so there’s no awkward re-sizing – no fiddling around with photocopiers or hanging around at printing shops – you can start creating straight away!